Precise is a powerful dental lab management software, which comprises a complete suite of modules and reports to simplify Dental lab management. It maintains distinct and detailed records of every doctor serviced by the laboratory. It provides a framework for communications both within the lab and with your dentist accounts to help your lab provide a consistently high level of customer service.Improved quality assurance and risk management. ...... It will also assist you in the challenge of attracting and managing new accounts, without compromising the level of service provided to your current clients. Software have powerful database for managing computer hardware and software. Qweas is providing links to Precise Dental Lab Management Software 3.0 as a courtesy, and makes no representations regarding Precise Dental Lab Management Software or any other applications or any information related thereto. 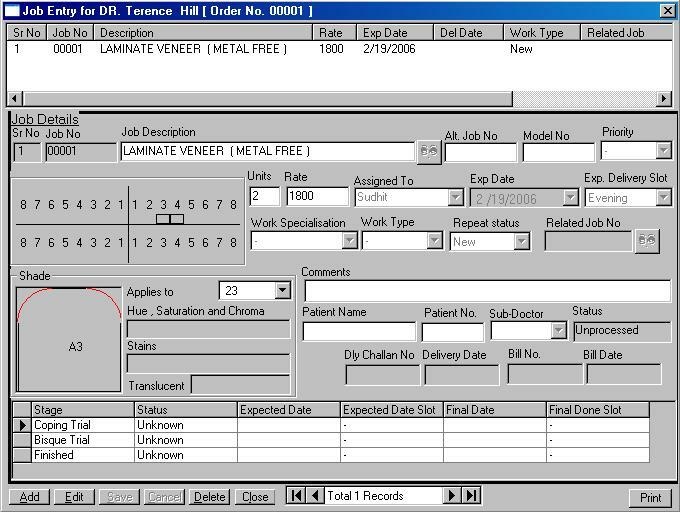 Any questions, complaints or claims regarding this application Precise Dental Lab Management Software 3.0 must be directed to the appropriate software vendor. You may click the publisher link of Precise Dental Lab Management Software on the top of this page to get more details about the vendor.